« WFW – Got Plans? All else you need are marching bands. Great! What fun! I love your red, white and blue. The tablecloth is very cool. Love the linens on the backs of the chairs. The napkin rings are great too!! You can never get tired of the red, white and blue!! Great photos! Happy Memorial Day and Tablescape Thursday ! God Bless America, love your table ! Lana…I love it! Those star plates are wonderful…perfect tablescape for Memorial Day! The collage is beautiful! Thank you for remembering our service men and women. What a wonderful red-white and blue tablescape! Happy Memorial Day to You! Terrific Tablesape and photo collage! Absolutely perfect for this weekend! I can just hear the fireworks now!! You really put on a great “Tablescape” I love seeing what you are going to do! Fabulous Memorial Day tablescape. I love the plates. very very cheery, I think we all need that! I love this! Thanks for sharing. You have given me some inspiration for my Memorial Day table. Have a wonderful day! What a great idea for the holiday! 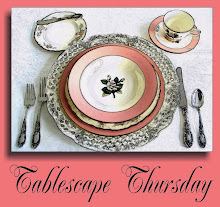 Stop by and see my table setting, if you like what you see, be sure to subscribe to my blog by clicking on “Follow” in the right hand column. This way we can inspire one another frequently! Be sure to stay a while when you’re there and enjoy the experience! Love the patriotic dinnerware. I’m still looking for the perfect red to go with my blue and white. Looks like you found yours. Your tablescape is perfect for Memorial Day. So festive. I absolutely love those star plates! Oh, my very favorite colors throughout my house: red and blue! I love to see them together! Your tablescape made me want to March in a Parade and wave the Red,White and Blue!!! Love it! Perfect for the upcoming weekend! Great dishes!! You have some wonderful ideas here for a holiday table. I just love the dolls and the way you did the backs of the chairs. So much inspiration! I hope you have a wonderful Memorail Day! What a festive talescape. I love the plates! I feel so patriotic! Thanks so much!